NOW: What is an Other? From the first Sunday in November we celebrate kindness to others over a duration of a week. We encourage others to get involved to perform acts of random kindness or celebrate our local kind heroes and volunteers in the community. 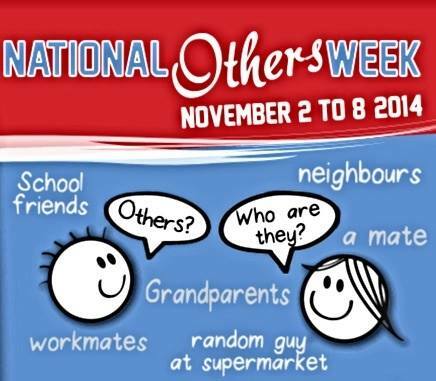 NATIONAL OTHERS WEEK (NOW) is about looking beyond ourselves and bringing kindness to others, thus fulfilling Albert Einstein’s observation that ‘only a life lived for others is a life worth living’. For seven days from the first Sunday in November, find a way to help someone, whether it’s a random act of kindness or a planned activity to show you care. Because…life is a team sport! Global Care, the Social Justice arm of Christian Outreach Centre, is the initiator and organiser of National Others Week. Global Care’s motto is ‘Mates helping Mates’ and NOW was created as a vehicle to bring kindness, justice and service to others. There are so many great ideas on our blog and our different global Facebook pages. Really it all depends on you. Already participating in acts of Kindness? Let us put your acts of kindness on the pinterest map by sending us your picture and acts of kindness to promote to the email above.